Last week I attended the annual meeting of the European Flood Awareness System partners. Each year the meeting is held in a different location. 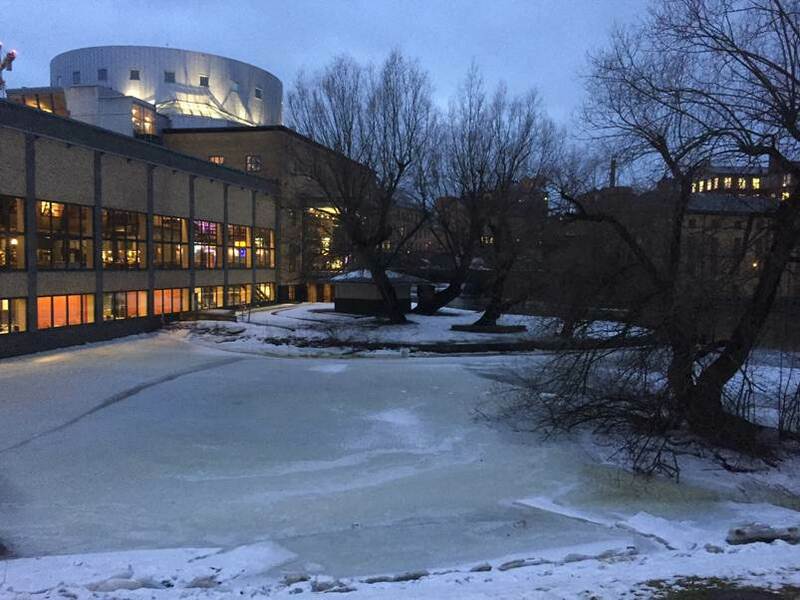 This year it took place in Norrköping, Sweden, home of the Swedish Meteorological and Hydrological Institute, part of the EFAS Dissemination Centre. The unexpectedly late winter conditions caused a few challenges to the transport for some of the attendees, and the need to wrap up warm, but overall the freezing temperatures and snow added more excitement to the proceedings. The new web interface. We all had a chance to trial this. The general agreement was that this will greatly improve ease of access to the data. Within the Scottish Flood Forecasting Service this should help us to integrate EFAS more fully into our operations. Poster presentations – as last year in the UK was fairly uneventful in terms of major flooding, SFFS submitted a joint poster with the Flood Forecasting Centre (England and Wales). One theme of the poster was that although EFAS often does pick up river flooding, it can fail to identify surface water flooding, even from fairly widespread rainfall events. The events in Scotland on June 6 2017 were used to illustrate this. New products within EFAS, in particular the Rapid Risk Assessment using flood maps; and also Seasonal Forecasting. Neither functionality is used very much as yet, partly due to unfamiliarity of the products within the user community. Communications between the partners and the centres, over issues such as data, contacts, notifications, event feedback etc. A notable current absence is the ability to feedback on events missed by EFAS. Downloading archive and near real time data for use in other systems. There is the potential for taking a feed of EFAS forecasts for use in forecasting systems such as FEWS Scotland in future (following development). Left: Richard Maxey (SFFS) and Julia Perez (FFC) present their poster on EFAS forecasts for the UK in 2017. Right: Peter Salamon presents the new extended domain for the model. The main highlight of the two days, however was the opportunity to meet and talk with old friends and new, to share experiences of EFAS and flood forecasting in general, and to reaffirm relations within the European flood forecasting community. This was perhaps the most valuable aspect of the meeting. Thanks must also be extended to our hosts at Norrköping, who made us all feel very welcome, and treated us to a city tour (based around the old industrial centre, driven by channeling of the waterways) and dinner with live music. This entry was posted in Conference, EFAS, Partnerships. Bookmark the permalink.